Configure UCR's Global Address Book! 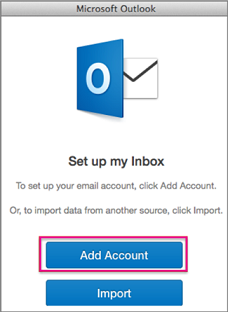 Click the account type, "Exchange or Office 365" to add your UCR email. If a pop up box asking 'Allow or "Deny' of autodiscover.ucr.edu select 'Allow'. 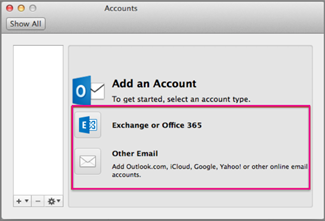 Your Office 365 account has now been added and should display on the left pane. Update your settings with account description and full name. The green button by the newly added account means Outlook is gathering your files. When logging into your Office 365 account through the client, you will be prompted for your CAS credentials (UCR Net ID and password). 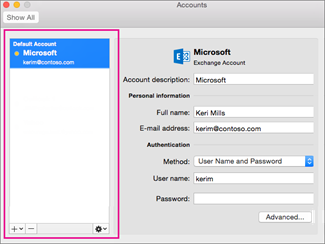 Follow the instructions below to configure the global address book for UCR employees on your Outlook for Mac 2016 desktop client.